Canon has squarely targeted the 'advanced amateur' market by today unveiling the 10.1-million-pixel EOS 40D digital SLR. Canon has squarely targeted the ‘advanced amateur’ market by today unveiling the 10.1-million-pixel EOS 40D digital SLR. 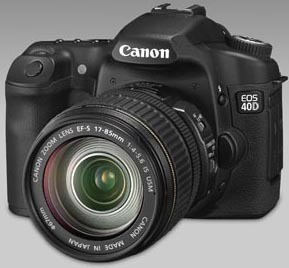 Billed as an ideal second body for professionals the 40D boasts improvements over its 30D predecessor such as a 3in LCD screen, Live View mode and a menu system borrowed from the EOS-1D Mark III. Canon has redesigned the nine-point AF system, claiming to have improved its speed, precision and ?functionality? using a cross-type AF system. ?The 10.1MP CMOS APS-C size image sensor has been significantly improved thanks to the use of larger microlenses over each pixel to reduce noise and expand sensitivity up to ISO 3200,? said a spokesman for Canon USA. Canon also claims it has upgraded the camera?s dust and weather resistance. Other features include a top shutter speed of 1/8000sec. Also on board is a DIGIC III image processor and 6.5 frames per second burst rate. The viewfinder features increased optical magnification (0.95x) and wider viewing angle than the 30D. There is also a new ?more manageable? sRAW mode, enabling the number of pixels to be reduced to a quarter of a standard RAW image and halving the file size. In the USA the 40D is expected to cost $1,299 and be available as a kit with an EF 28-135mm f/3.5-5.6 IS USM zoom, priced $1,499. No UK specification was available at the time of writing. The camera is expected to be officially announced in the UK at a press conference in London later this morning.